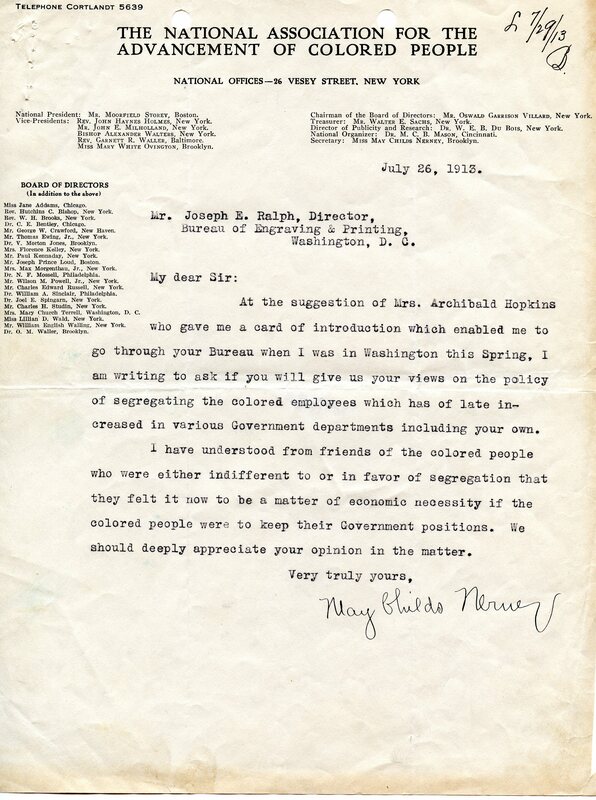 May Childs Nerney of the NAACP to JE Ralph asking his opinion on the policy of segregation in the federal government. 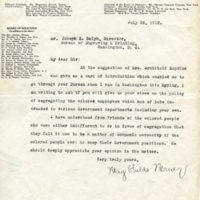 At the suggestion of Mrs. Archibald Hopkins who gave me a card of introduction which enabled me to go through your Bureau when I was in Washington this Spring, I am writing to ask if you will give us your views on the policy of segregating the colored employees which has of late increased in various Government departments including your own. I have understood from friends of the colored people who were either indifferent to or in favor of segregation that they felt it now to be a matter of economic necessity if the colored people were to keep their Government positions. We should deeply appreciate your opinion in the matter. Nerney, May Childs, “May Childs Nerney to JE Ralph,” 1913 July 26, SE072613a, Race and Segregation Collection, Woodrow Wilson Presidential Library & Museum, Staunton, Virginia.